AMAZING OPPORTUNITY TO OWN A BEAUTIFULLY MAINTAINED HOME ON OVER 3/4 OF AN ACRE IN DESOTO COUNTY! This home is unlike any other on the market. You will love the interior of the home with the natural light coming from the multiple silverline windows. The master suite is large and features 2 walk in closets and a master bathroom with a garden tub, separate shower and dual sinks! The living room flows right into the dining room and kitchen! Stainless steel appliances and custom tile counter tops are sure to please in this kitchen! A bonus family room with new vinyl plank and views to the back yard comes partially furnished with a 60 inch tv included! The 2 guest bedrooms are spacious and one of the rooms features tons of shelving and cabinetry that can be easily removed. Enjoy the beautiful Florida Sunsets on the screened back porch. It has plenty of room for multiple tables and would be perfect for entertaining. The roof was replaced in 2017 and the well and septic are regularly maintained! There is also a 12x24 shed/workshop with electricity already hooked up. 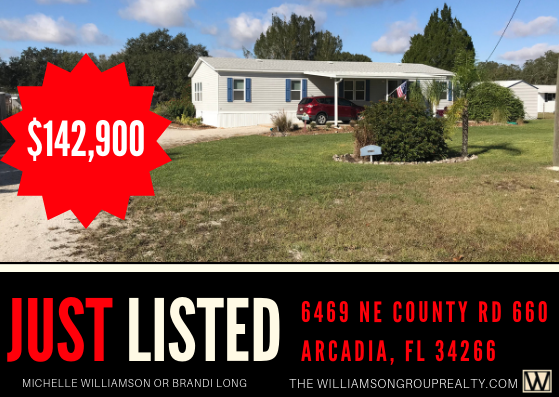 This property measures .78 of an acre, is mostly fenced and sits a few miles north of the city limits of Arcadia. The quiet country life is now affordable with this property offered at $142,900!